My last two posts focused on General Topics for GDPI and Economic Issues for GDPI. If you have favourite subject(s), you must be comfortable with almost everything related to this subject. Also, throw a glance at your project(s) work and paper presentation(s). Also, think about Plan B, i.e., what if Plan A (of doing an MBA and later career choices) does not work out. Information about home town/state – uniqueness, history, cuisine, comparison between home town and town of employment (if different from home town). What did you learn from work, etc. Which school will you join (in case of multiple calls). Be invested in your future. Be passionate. Work hard. Keep learning! Preparing for GDPI (also called GWPI)? Focus on the following general knowledge areas. Refugee crisis in EU and changing attitudes towards refugees. Religion – conversions & reconversions debate. Also read Economic Issues for GDPI. If you have secured or are expecting an interview short-list from a b-school, you should now focus on your preparation for the highly competitive and rigorous stages like GD, Essay (variously called Written Ability Test or Writing Test), and Interview (GWPI). o BRICS – why Russia and Brazil are in recession. § what other steps can be taken to tackle black money and fake currency. o Make in India and industrial clusters. A seemingly innocuous phone call between the U.S. President-Elect Donald Trump and Taiwan's President Tsai Ing-wen ignited a war of words between China and Donald Trump. In a series of short articles, I will focus on the historic and current status of the relationships between the U.S.-China, U.S.-Taiwan, and China-Taiwan. The following are the major issues that characterize the uneasy relationship between the U.S. and China. (j) cyber-attacks on American corporations;. Of the above, there are two that cause China the greatest discomfort: Tibet and Taiwan. In the coming series of short posts, I will explain some of these disputes. Labels: China, Far East, International, Politics, The Explainer, U.S.
Apple is the world's biggest technology company by revenue. The company has, because of its tax-avoidance approach, often got into regulatory crosshairs. In August 2016, the Cupertino, California-based tech behemoth was ordered by the European Union to pay a fine of euro14 billion for breaking tax laws. After years of neglect and if I may say, marketing myopia and downright arrogance, Apple has evinced interest in setting up production units in India. It won’t directly own the production units; rather, they will be set up by Wistron, a contract manufacturer of electronic devices. 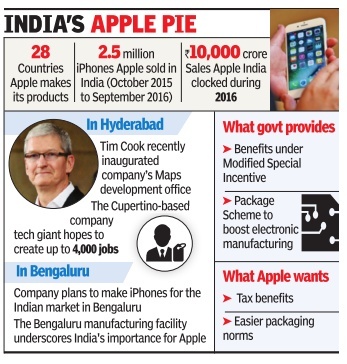 Also, it won't export its made in India phones and other devices! In India, a single brand retailer has to source 30% of the stuff sold from local business units; this, the Government believes, will give impetus to local industry to invest better technology and thus enhance overall manufacturing ecosystem and higher employment generation. About six months back, Apple asked for a waiver of this 30% local sourcing clause and the Government of India agreed to it on the condition that such waiver will be for the first three years only. Now it is asking for more in terms of tax breaks and other concessions. I think the government should not concede any more concessions than are available to all such companies in the sector. I am sure giving into Apple’s demands will create a lot of heartburn and set a bad precedence. I have resolved to blog on a regular basis, starting with this infographic from here.